".... The school committee of any city, town, or school district shall establish a parent advisory council on special education. Membership shall be offered to all parents of children with disabilities and other interested parties. The parent advisory council duties shall include but not be limited to: advising the school committee on matters that pertain to the education and safety of students with disabilities; meeting regularly with school officials to participate in the planning, development, and evaluation of the school committee's special education programs. The parent advisory council shall establish by-laws regarding officers and operational procedures. In the course of its duties under this section, the parent advisory council shall receive assistance from the school committee without charge, upon reasonable notice, and subject to the availability of staff and resources. ..."
In addition, accompanying state regulation reiterates the language of the statute (see 603 CMR 28.07(4)) and provides further guidance to PACs on their role with districts, including providing at least one workshop annually within the school district on the rights of students and their parents and guardians under state and federal special education laws. Operating under these laws and regulations, the Hingham SEPAC successfully expanded parent participation in SEPAC and advocated for improved services for students with special needs during the 2016-17 school year. 2016 MCAS data regarding students with disabilities in Hingham highlighted significant concerns for parents (see Table 1). For the general population of students, Hingham students consistently ranked in the top three compared to peer towns in English, math and science. In contrast, students with disabilities in Hingham ranked at or near the bottom in each subject area as compared to students with disabilities in our peer towns. 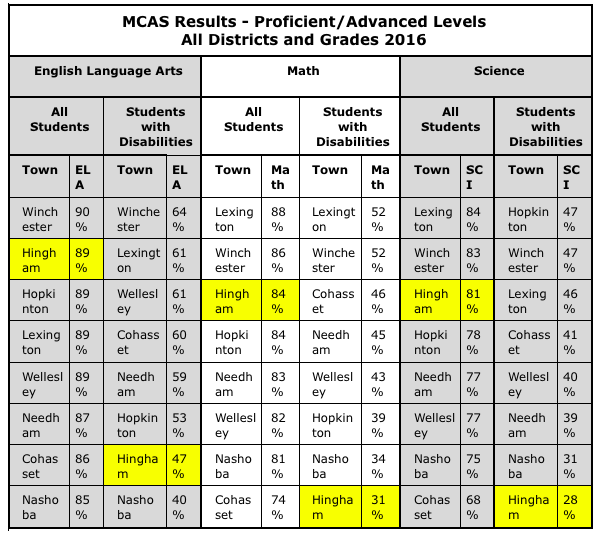 Equally concerning were the trends in the percentage of students achieving proficient and advanced levels on the MCAS over the last five years in Hingham. While general education students have generally seen a climbing percentage of students achieving proficient or advanced levels since 2014 (see Chart 1), the opposite is true for students with disabilities (see Chart 2). In September 2016, SEPAC began hosting an informal, monthly drop-in breakfasts at Bruegger’s Bagels for parents to ask questions and build networks. On October 6, 2016, SEPAC hosted Dr. David Murphy to present on homework strategies. On October 12, 2016, SEPAC hosted the annual Rights and Responsibilities presentation in collaboration with administration. On November 9, 2016, in response to a grassroots movement led by local families, SEPAC dedicated our meeting to hearing concerns related to special education directly from parents. The meeting culminated in a motion asking the special education subcommittee of the school committee to engage a diverse group of stakeholders to review continuous quality improvement practices, promote transparency, and ensure effective use of taxpayer dollars. In a show of good faith, parents also agreed to reconvene quickly to form subcommittees addressing the same issues. On November 10, 2016, SEPAC hosted an evening parent social. On November 16, 2016, SEPAC reconvened parents to continue constructive conversation around improving special education. Approximately 40 parents agreed to serve on three subcommittees: best practices, transparency and finance. Parents expressed a willingness to undertake this work, but there was also significant support for bringing in an expert in special education to do an independent evaluation of Hingham’s special education system. On November 21, 2016, SEPAC presented the vision statements of the subcommittees along with a detailed information request to the full School Committee in an effort to be clear and transparent regarding areas of concern and SEPAC’s next steps. On December 14, 2016, a joint meeting of SEPAC and the School Committee was held. Ms. Kurlan presented regarding the five pillars of continuous quality improvement in special education and Dr. Galo presented regarding her annual goals and findings of the 2012 independent evaluation of special education (Walker report). Parents called publicly for releasing the Walker report in full. Parent subcommittees presented the results of their work to date. On December 16, 2016, at the behest of parents, SEPAC submitted a formal request to Dr. Galo to release the Walker report. The School Committee joined SEPAC and parents in this request and the report was released. On December 19, 2016, the full School Committee received an update on the work of the SEPAC parent subcommittees. School Committee liaisons to subcommittees were identified. On December 21, 2016, again at the urging of parents, SEPAC sent a formal request to the School Committee Chair and administration requesting funds for an independent evaluation for the 2017-18 school year. On January 9, 2017, in addition to receiving a significant amount of correspondence from the community, School Committee members also heard directly from a large group of parents regarding funding an independent evaluation during the public comment portion of the meeting. School Committee members requested more specificity regarding the nature of an independent evaluation. Parents requested clarity in regard to when funding an independent evaluation would formally be on the School Committee agenda. On January 11, 2017, SEPAC engaged parents in further specifying the focus of an independent evaluation, agreeing that an evaluation should focus on program culture, management and structure. Parents emphasized that perspectives from students, parents, teachers, paraprofessionals, specialists and administration should contribute to the evaluation, as well as review of student data and budget data. Parents also requested that they continue to be involved in specifying the specific scope of work for an evaluation. On January 12, 2017, Liza O’Reilly and Dr. Ed Schreier joined the SEPAC parent breakfast to hear concerns and suggestions related to improving special education from the parent community. On January 18/19, 2017, Dr. LaBillois delivered two Special Education Update Workshop Sessions to the community designed to provide you with an overview of the activities that have been completed to date, the work that is ongoing, and the work that is planned to unfold over the next several months. He also presented a proposal for a comprehensive independent evaluation of our programs and services for students with disabilities and asked for feedback. Parents and community members came out in large numbers to consider his perspective and engage in constructive conversation. On January 19, 2017, the School Committee convened for a special budget session related to special education. Dr. LaBillois presented an abridged version of the Special Education Workshop and parents again raised questions regarding a budget line item funding external evaluators. The SEPAC Board chair reaffirmed SEPAC’s support of funding an independent evaluation. On January 24, 2017, parents obtained access to all settlement agreements entered in to between HPS and parents from January 2012 to present relative to the provision of special education services and educational placement(s) for students with disabilities, redacted of all personally identifying information. The original public information request was submitted in October and the agreements were only provided after the Supervisor of Public Records affirmed the position that Hingham had to disclose all settlement agreements pertaining to special education, whether or not they related to out-of-district placement, as well as the fact that the district was overcharging for redaction costs. On January 26, 2017, the SEPAC Board requested that the issue of funding an independent evaluation of special education be formally placed on the January 30th School Committee agenda so that it could come to a vote. On January 30, 2017 heard from Dr. LaBillois regarding the MCAS scores of students with special needs (see Table 1 and Chats 1 and 2 above). On February 2, 2017, members of SEPAC joined the Hingham School Committee, Advisory Committee and the Board of Selectmen for a joint meeting regarding the School Department’s proposed FY’18 Budget and advocated for funding an independent evaluation of special education. On February 8, 2017, Liza O’Reilly, School Committee Chair, and Linda Kutsch, Advisory Committee, gave an overview of the town budgeting process. On February 13, 2017, the School Committee adopted the budget proposal that included allocating up to $25,000 to fund Year 1 of Special Education Continuous Improvement. $10,000 was allocated from budget line S2100 (SPED legal budget), up to $5,000 from budget line R2350 (professional development) and up to $10,000 from the FY ‘18 IDEA grant. On March 8, 2017, SEPAC revised the bylaws and voted to expand membership to parents with children on 504 plans and to use paper ballots to confirm voting eligibility. On March 21, 2017, the first meeting of the Special Education Improvement Task Force was convened, which included members of the administration, staff, and a parent representative form each school. On April 12, 2017, SEPAC hosted a presentation by Nicole Merhill, a former section leader at the Office of Civil Rights, regarding Navigating the OCR complaints process. On April 13, 2017, SEPAC hosted candidates for School Committee at the monthly SEPAC breakfast. The election used an online ballot for the first time, which greatly enhanced voter turnout as compared to prior elections. SEPAC will continue advocating for all students in the district so that every child can reach their full potential in a more inclusive environment. SEPAC will survey parents across the district to identify areas of particular concern for parents and focus advocacy efforts on those topics in 2017-18. SEPAC will also advocate that any quality improvement efforts related to special education programs be rooted in research and evidenced-based practices. SEPAC will continue to look at successful practices in our benchmark towns and neighboring communities and encourage School Committee and Administration to do the same. 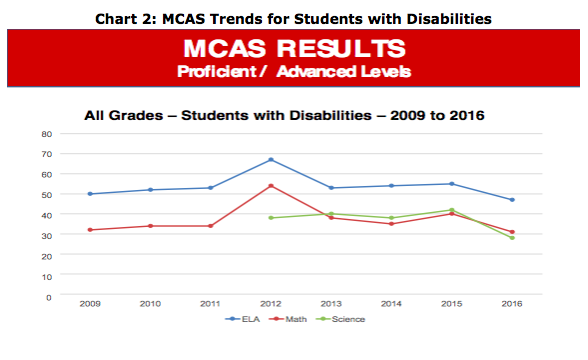 We will also continue to request achievement based results for our students, particularly in light of the declining MCAS scores of our students with disabilities. SEPAC will prioritize transparency and clear communication relating to our special education services. SEPAC will continue to advocate for and help facilitate regular updates regarding special education from administration to parents, the Special Education Subcommittee of the School Committee and the full School Committee. SEPAC will also provide independent updates at School Committee meetings as needed. SEPAC will work collaboratively with the School Committee and Administration to address collective parent concerns while maintaining independence and ensuring accountability. This will include developing long- and short-term goals with clearly defined timelines and benchmarks to ensure that special education continues to improve across the district. SEPAC will also provide increased support and networking opportunities for parents to connect and share resources and information, with a focus on helping provide resources for parents who are new to the system. It can be an isolating experience trying to navigate special education and services. The value in sharing information and experiences with other parents cannot be overstated. We will continue to hold monthly parent breakfasts and increase the number of evening support gatherings for working parents. Based on feedback provided in the SEPAC survey, SEPAC will also focus on hosting events on topics that will help parents to better understand their rights, advocate for their children and increase community knowledge and awareness in specific areas of interest. Topics may include: social emotional issues, social skills, anxiety, depression, bullying, dyslexia, ADHD, transitioning to college, best practices in other school districts. In 2017-18, SEPAC seeks to foster a culture where high achievement is expected from every student, including those with disabilities. In effective, inclusive schools, educators think of students with disabilities as the backbone of the schools. By focusing on reaching those who were potentially the most difficult to reach, teachers in inclusive schools find that their planning served to benefit the larger population of students. Teachers and administrators in successful inclusive schools have high standards for all students. SEPAC will continue to work to foster such a culture in Hingham.